DR.SANTOSH KUMAR B, M.B.B.S., M.D. 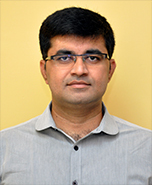 Dr. Santosh Kumar B joined ICMR-NIN in March 2016 and is currently associated with the Drug Toxicology Division and also the Advanced Centre for Preclinical Toxicology Department. He has been constantly upgrading his skills by taking part in various research activities related to Preclinical toxicology, clinical trials, clinical nutrition, public health and patient safety. Areas of work and interest include - Antimicrobial resistance in relation to nutrition in pediatric population; Preclinical safety / efficacy evaluation of Biopharmaceuticals products; Nutravigilance and Pharmacovigilance; clinical trials; heavy metal analysis and public health He has MBBS from Government Siddhartha Medical College , Vijayawada AP and MD in Pharmacology from Osmania Medical College Hyderabad. He served as Associate Professor, Pharmacology Department in Chalmeda Anand Rao Institute of Medical Sciences, Karimnagar, Telangana. He has over five years experience in teaching Medical Postgraduate, Undergraduate, Nursing students. He was also holding an additional responsibility as the Coordinator for Adverse Drug Reaction Monitoring Centre at Karimnagar under Pharmacovigilance Program of India (PvPI), Indian Pharmacopiea Commission (IPC) Gaziabad. He is a Life member of Association of Food Scientist and Technologist (India)(AFSTI), Life member of Indian Pharmacological Society (IPS), Life member of Nutrition Society of India(NSI), Life member of Indian Society for Rational Pharmacotherapeutics(ISRPT), Life member of Indian Medical Association (IMA) and Indian Medical Association of College of General Practitioners (IMACGP).